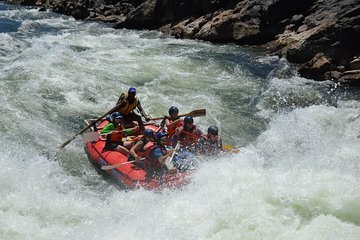 Paddle down the Zambezi River on a 14-mile whitewater rafting course from Victoria Falls. With a guide, maneuver over Class IV and V rapids in a gorge reaching depths of 650 feet (200 meters) in the heart of Zimbabwe’s wilderness. Begin your adventure with hotel pickup from your lodging in Victoria Falls prior to a 7:30 a.m. start time. Enjoy a light breakfast of toast with coffee or tea, and then climb into a Jeep for a drive to the Zambezi River. Upon arrival, gear up in a provided life jacket, helmet, and windbreaker (if needed), and go through a full safety and instructional briefing before hiking down the steep gorge to the river banks. Depending on your group’s abilities, you will either complete the 14-mile course (23 kilometer) in an oar raft controlled completely by your guide, a stern-mount raft controlled by passengers and the guide, or a paddle raft where everyone paddles under your guide’s watchful eyes. Passengers who visit during low-water season from August through December can expect Class IV or V rapids throughout the journey, while those who visit in the high-water season from mid-January through March and June through July may clip some rapids and overall distance for safety reasons. Please note that due to fluctuating water levels, rafting operations may cease in April in May. At the end of your trip, make the steep climb out of the gorge — an open bar and barbecue lunch reward your effort at the top. After lunch, return to your hotel.